Cut any of his family and you can be sure they'll bleed amber and black. 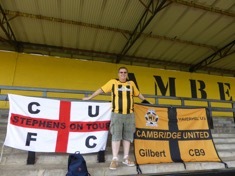 My first match was in 1960, when my mum took me to meet Dad, an avid U’s fan, at the Cambridge United v Merthyr Tydfil match. My dad, his father and my uncle used to stand in what is now the Habbin Stand. As I grew up in Sturton Street, one of my earliest memories was walking with them round the old brick pit (now the retail park) to the Abbey Stadium. 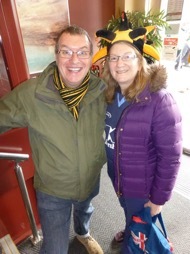 My sister and I were taken to King’s Lynn one cold, foggy Boxing Day to see the mighty U’s, and so the seeds were sown for a lifelong love affair with a very special team. In those early 1960s the U’s were the second team in Cambridge behind City, but there was only one team as far as my family were concerned, and they played in black and amber. The players were icons to me and my mates at Brunswick Junior School. I hated our school colours (black and white) and longed to be good enough to play in amber and black. I remember going to Chelmsford with Dad and his mates in my Uncle Alan’s Ford Anglia, as we rose up the Southern League. By the time we were voted into the Football League I had been a regular supporter for a number of years. I was on one of the official coaches that met the U’s players at Royston Heath on their way back from Germany to celebrate our promotion to the League in 1970. 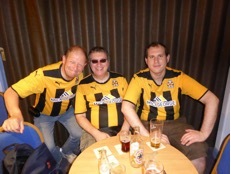 My brother David was also introduced to the mighty U’s by our dad and has been an avid fan ever since. My mum was a regular too, and helped to wash the kit in the first couple of seasons in the Conference. and dearest friends are U’s fans and I feel part of the family whenever I go to a match and am acknowledged by many mates and acquaintances who are equally true U’s. I enjoy travelling to matches with Jamie, who has taken on the family baton with glee. Cut either of us through and you will find a black and amber core. When my father died 14 years ago I inherited his few shares, and I voted against selling the stadium on that fateful night when our club was torn from us. I was at the meeting when the offer was made to and agreed by the creditors, which meant we still had a club to support. If we had gone under I would only have supported a phoenix club; I could never jump ship. Since I inherited those shares I have increased my shareholding within my meagre means and I know most of the directors to talk to. I was working at Ridgeons when Will Jones approached me with a request for a donation of paint for the Corona End (NRE to the uninitiated). I obliged the following year with the specialist paint for the Habbin, and when the requests kept coming in for more and more of it I even dug into my own pocket to buy the paint to finish the job. Anyone I have ever met has known which football team I support. Being a U makes me so very proud, and the presence of so many kids at games ensures this great club will go on long after I am dead, just as my Jamie will ensure that the Stroud name will be part of the Amber Army for many years to come. Come on you U’s.